Dorothea Lynde Dix (April 4, 1802 – July 17, 1887) was an American activist on behalf of the indigent insane who, through a vigorous program of lobbying state legislatures and the United States Congress, created the first generation of American mental asylums. During the Civil War, she served as Superintendent of Army Nurses, her even handed care of both Union and Confederate Soldiers alike. But her health broke down, and from 1824 to 1830 she was chiefly occupied with the writing of books of devotion and stories for children. Her Conversations on Common Things (1824) had reached its sixtieth edition by 1869. In 1831 she established in Boston a model school for girls, and conducted this successfully until 1836, when her health again failed. In hopes of a cure, in 1836 she traveled to England, where she had the good fortune to meet the Rathbone family. The Rathbones were Quakers and prominent social reformers. Dix met men and women who believed that government should play a direct, active role in social welfare. She was also exposed to the British lunacy reform movement, whose methods involved detailed investigations of madhouses and asylums, the results of which were published in reports to theHouse of Commons. She was instrumental in the founding of the first public mental hospital in Pennsylvania the Harrisburg State Hospital in 1853. The outcome of her lobbying was a bill to expand the state's mental hospital in Worcester, Ma. The culmination of her work was the Bill for the Benefit of the Indigent Insane, legislation to set aside 12,225,000 acres of Federal land (10,000,000 acres for the benefit of the insane and the remainder for the "blind, deaf, and dumb"), with proceeds from its sale distributed to the states to build and maintain asylums. Dix's land bill passed both houses of Congress, but in 1854 President Franklin Pierce vetoed it. Dorothea Dix gave this what appears to be a water fountain for citizens, instead a horse watering stop in the middle of the city of Boston, to the George Thorndikes Angel’s animal humane society for dumb animals. "Boston Bronze and Stone Speak To Us" intends to add this granite historical Boston Monument into our next edition. 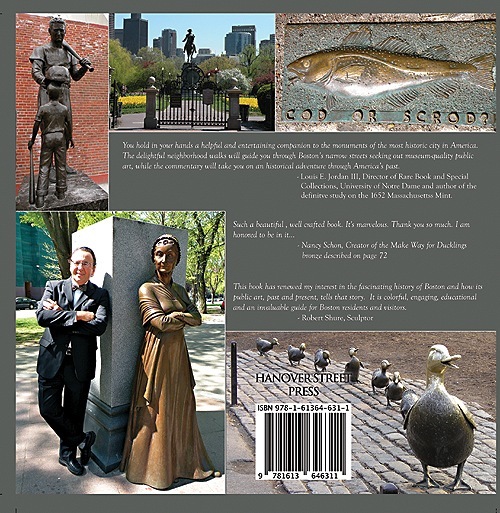 "Boston Bronze and Stone Speak To Us" can be purchased on Amazon.com, Best Sellers Cafe Book Store, Old North Church Gift Shop, Barnes& Noble Book Stores. Boston's Love of our Boston Redsox and our Boston Monuments! 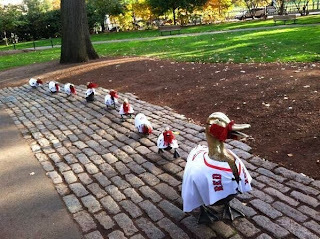 Nancy Schon's "Make Way for Ducklings " celebrates our Boston Redsox! As well as our city. Go Sox! 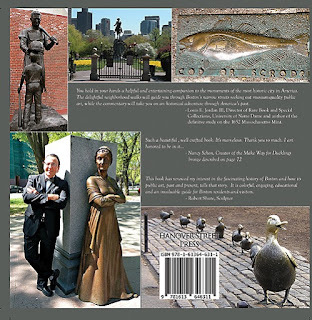 "Boston Bronze and Stone Speak To Us"sold at Amazon.com , Bestsellers Cafe Bookstore, Old North Church Gift Shop, Barnes & Noble, Trinity Church and our local book stores in Boston. Dancing with The Spheres by David Phillips and Boston Common Frogs an earlier work by Phillips, will be discussed at the Bestsellers Cafe Bookstore, 24 High Street, Medford Square, Mass at 3:00 pm October 12, 2013. David Phillips, sculptor of the above bronze sculptors will be talking at Bestsellers Cafe Bookstore this Saturday October 12, 2013 at 3:00pm in Medford Square . He will be talking about his new book on his works of sculpture. Joe Gallo, author of "Boston Bronze and Stone Speak To Us", will be introducing David and his works and discussing these works within the scope of Joe Gallo's Art/History book. All are welcome, both books will be for sale! 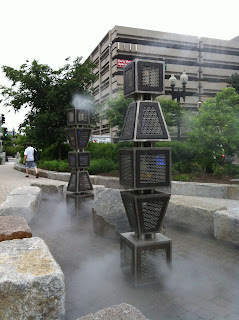 Ross Millers sculpture “Harbor Fog”, mysteriously and subtly reminds us of the the commercial importance, the danger,the history of the Boston Harbor and its islands. This modern interactive sculptor composed of granite stone taken from ancient Boston wharfs incorporates the skills of electricians, LED lighting, plumbing, motion detectors, as well as marine bronze. 21 Granite seawall stones, discovered and salvaged from wharves uncovered during Central Artery construction, form a boat-shaped sculptural landscape with openings to invite one into he interior space. 3 buoy markers, built of stainless steel and naval bronze, inspired by Boston Harbor navigational buoys. 12 motions sensors - ultrasonic sensors used for industrial control systems and additional infrared and microwave sensors cue fog, light and sound. 72 high pressure water fog nozzles used in the industrial cooling industry. 12 color Blast LED fixtures,provide over 16.7 million colors,controlled by IP addressable digital sequencer. DIgital data processor, timers, astronomical clock, control software, to interpret pedestrian motion and control system response. Digital sound, provides on the hour bells and sound sequences cued by motion sensors . Ross Miller's ideas evolve by examining the site’s ecological and social history, patterns of pedestrian activity, quality of light, and proposed future uses in order to create public artwork that makes direct connection with the site, heightening one’s experience of being in that specific place. Sited in publicly accessible locations - urban squares and parks, in schools, subway tunnels, along highways and over city streets - these projects evolve through collaboration with local residents, school and community groups, planners, architects, landscape architects and other artists. The projects range from urban and architectural scale installations to intimate pedestrian scale sculptures. Harbor Fog sculptor's, lighting work, more decorative in nature, has been developed by Miller from an original system developed from steel cable, net and commercial electric fixtures. These light installations contribute to urban experience in the dark cold times - at night and in the winter. At night the artworks appear to float due to fog mist emitted from the sculptor. This Interactive artwork is located along the harbor side pedestrian walkway of Greenway Parcel 17, between the Aquarium and Rowes Wharf. Granite seawall stones, salvaged from nearby piers, form a boat-shaped sculptural landscape with openings to invite pedestrians into an interior space. Here three vertical sculptural beacons, inspired by Boston Harbor navigational buoys, contain multiple fog nozzles, LED light sources, and a sound system. Motion sensors at the top of the sculptures respond to pedestrian activity to initiate changing patterns of fog mist and light. Gusts of wind redirect the fog, colors change with seasons and ambient light conditions. Pedestrian activity, picked up by multiple motion sensors, creates changing effects that encourage people to move, explore and play with the sculptural buoy elements. During warmer months the evening fog is illuminated by changing color progressions of LED light. In winter, with the fog turned off, light sparkles from within and projects out from the stainless steel beacon sculptures. In stormy weather light projecting from the sculptures projects patterns on snow-covered landscape. Fog and lighting systems are industrial components designed for low maintenance and long operational life. Annual operation of the Harbor Fog water system follows seasonal schedule for park irrigation maintenance. The lighting and motion control systems operate throughout the year. Concept and design by artist Ross Miller over a three year period with support for the Central Artery/Tunnel Project and Mass Turnpike Authority. Over 85 people have been evolved in the realization of this project: mechanical and electrical engineers, site construction workers, union tradespeople, steel fabricators and installers, digital and 3d model makers and management staff. Project concept development began in the spring of 2005; site landscape work May - September, 2007; water system elements installed September - October, 2008; electrical sensors & programming April - May, 2009. This kid friendly sculpture has always been a delight for me and every other kid who has visited Boston Commons’ Frog Pond. Two 4-foot-high bronze frog sculptures watch over the winter skaters and summer waders at the Frog Pond on Boston Common. From their perch on the eastern end of the pond, they look across Charles Street to the trees in the Boston Public Garden. According to Joseph Bagley, if you were standing on the same spot 8,000 years earlier, the pond would still be there inhabited by real, not bronze, frogs. In place of the skaters and waders, you’d find indigenous peoples living around the pond, and thousands of clamshells would be visible, scattered along a shoreline reaching as far as Charles Street. Bagley, a recent archaeology graduate, easily paints this picture—the fruit of senior work for distinction, funded by UROP, in which he studied artifacts excavated from the area around the Frog Pond. 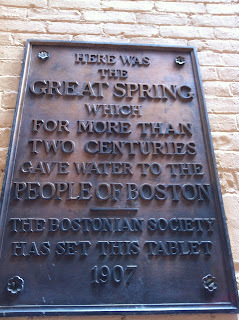 This plaque is dedicated to the first and most important fresh water spring discovered in Boston. 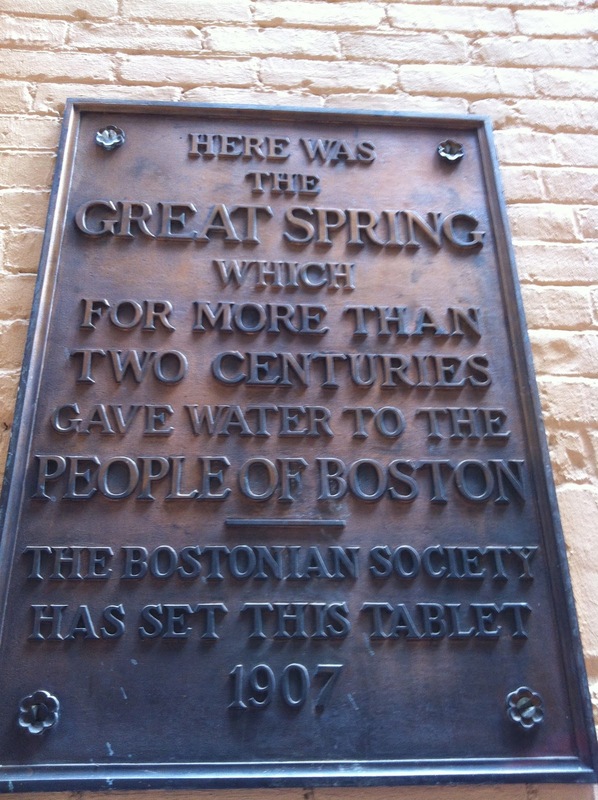 This fresh water source was shared by William Blaxton who first resided on Beacon Hill. Blaxton or Blackstone who educated Governor John Winthrop about the "sweet water"source that enabled the new immigrants from England to establish a successful Massachusetts Bay Colony in 1630. This was Boston's water source for many years until nearby and not so nearby reservoirs such as our Quabbin Reservoir is our primary source today. "Boston Bronze and Stone Speak To Us"intends to add this Boston Monument to our next edition of our book. Boston Monuments celebrate The July 4 th "Pops" at the Esplanade. Every July 4Th The Boston Pops celebrates our county's independence with traditional American patriotic music. Every day of the year our Boston monuments guard our esplanade with some of the most memorable sculptures depicting our Nation's and Boston historical leaders. George Patton, WWII hero and Charles Devens, civil war hero both of military leadership. Both men are comemerated as Boston stautes populating the Boston Esplanade. Arthur Fiedler's creation of the Boston Pops is memorialized by Hemlicks sculptural head which celebrates another form of heroic leadership; musical foresight. The sculptor, Helmick, depicts Fiedler’s forceful musical passion embodied in a monument constructed of granite and layers of aluminum, an exception to Boston's theme of bronze and stone sculptures, but Fiedler was an exception in symphonic conductors. ￼￼￼￼￼at the nearby Hatch Shell. 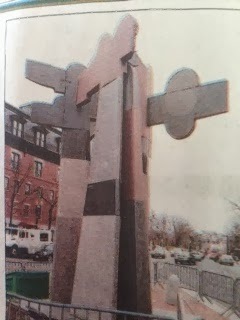 Cambridge sculptor Ralph Helmick earned a B.A. from the University of Michigan in 1974 and an M.F.A. from the Boston Museum School in 1980. This monumental head is built up of cut out layers of aluminum in varying thicknesses, a distinctive technique originated by Helmick. Joe Gallo, author, of "Boston Bronze and Stone Speak To Us"celebrates our country's birthday with another Boston hero immortalized in Hemlick's monument to Arthur Fiedler. Vendome Firemen's Monument Remembered June 17th. a Boston Monument. Joe Gallo spoke at the Rabb Lecture Hall last Thursday for the "Never To Late Club series". Joe met new friends and reunited with some of his Boston Monuments both inside Boston Public Library and outside in Copley Square. Branchette and Faun were dancing on the water within Fredrick MacMonnies courtyard water fountain. Sir Henry Vane by Fredrick MacMonnies was there greeting me at the original entrance of this McKim Italian Rennasance edifice. Daniel Chester French's low relief Panel Doors Truth and Romance, Knowledge and Wisdom and Music and Poetry were there as well. Guarding the Library's street entrance of the BPL, Bela Pratts' Art and Science sit contemplatively in the sun. The only square in America named after an American artist, John Copley by Lewis Cohen stands talk outside on busy Copley Square. Nancy Shon's Tortoise and Hare racing to the Marathon finishing line of life. Bob Shure's Boston Marathon Memorial Monument celebrating for all men, all women and all disabled athelets their victories. Augustus Saint -Gaudens' Phillip Brooks stands tall with Jesus outside, Henry Hobbs Richardson's masterpiece, Trinity Church. Finally and sadly a most recent monument is emerging in Copley Square, The Boston Bombing Memorial waits to be conceived with Bronze and Stone. 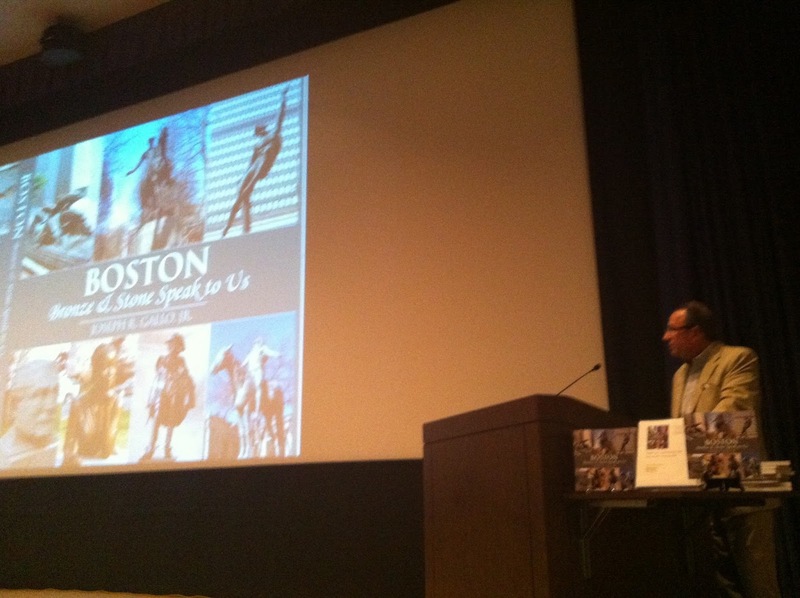 All of the above artists and monuments inspired and directed me in that day's Boston Bronze and Stones talk. The inspiration of the Bobby Orr Moument for the Boston Bruins team. Boston’s great Bobby Orr serves as inspiration for all who visit the TD Garden. Orr and the Boston Bruins, the 2011 Stanley Cup Champions, are honored in this monument to triumph, victory, athletic accomplishment, and team spirit. Under a clear blue sky on a cool spring afternoon, in the shadow of TD Garden and in front of thousands of adoring fans, friends and family, Bobby Orr unveiled the 800-pound bronze statue commemorating his famous overtime goal against the St. Louis Blues that gave the Boston Bruins the 1970 Stanley Cup 40 years ago. The ultimate team player, Orr was thrilled to learn that the base of the statue bears a replica of that section of the Stanley Cup that bears the names of all his teammates, coaches and team officials. Orr was joined by former teammates Johnny Bucyk, Derek Sanderson, Ken Hodge Sr., Johnny “Pie” McKenzie, Don Marcotte and Gary Doak. Orr gave spe- cial thanks to Kathy Bailey, the widow ofGarnet “Ace” Bailey who died in the Sept. 11, 2001, terrorist attacks on the United States. (Read more: http://www.foxnews. com/sports/2010/05/10/orr-statue-un- veiled-flight-forever/#ixzz1877IiEtX, Dec. 14, 2010). The 2013 baseball season is upon us, and with this sport Boston's Public Art and artists have created memorable athletic individuals and positive roll models for us all. Two monuments celebrating "Ted Williams "by Franc Talarico and "Teammates" by Antonio Tobias Mendez are both artist and tell us about the meaning of American baseball. Williams was a two-time American League Most Valuable Player (MVP) winner, led the league in batting six times, and also was a Triple Crown winner. A nineteen-time All Star, he had a career batting average of .344, with 521 home runs and was inducted into the Baseball Hall of Fame in 1966. Theodore Samuel Williams (August 30,1918 – July 5, 2002), was an American professional baseball player and manager. He played his entire 21-year career as the left fielder for the Boston Red Sox (1939-1942 and 1946-1960). with 500 or more home runs. His career year was 1941, when he hit .406 with 37 HR, 120 RBI, and 135 runs scored. His .551 on base percentage set a record that stood for 61 years. Nicknamed “The Kid”, “The Splendid Splinter”, “Teddy Ballgame”, and “The Thumper” because of his hitting prowess, Williams’ career was twice interrupted by military service as a Marine Corps pilot. An avid sports fisherman, he hosted a television show about fishing and was inducted into the IGA Fishing Hall of Fame. Ted Williams was one of the greatest hitters who ever lived, an American patriot, and a pioneer in the development of the Jimmy Fund. Ted will forever be one of the great heroes in the history of baseball, Boston, and America. He amassed 521 home runs despite sacrificing five years in his prime to serve his country during World War II and the Korean War. He was a relentless champion of children, such as this child to whom he is offering his cap, in their battles against cancer, and helped make the Jimmy Fund at the Dana Farber Cancer Center Institute the world renowned center of research it is today. "The memory of Ted Williams will forever be a point of pride for the Boston Red Sox, the people of Boston, New England, and the United States of America. Dedicated this 16th day of April, 2004." "The Red Sox fans the world over, they are simply known as Bobby, Ted, Dom and Johnny." These are our Red Sox Hall of Famers. Williams, Pesky, Doerr and DiMaggio have a permanent home at Fenway Park. Watching Ted Williams on TV hit home runs out of Fenway Park was a Sunday ritual for my father and I, as for many of us in Boston. 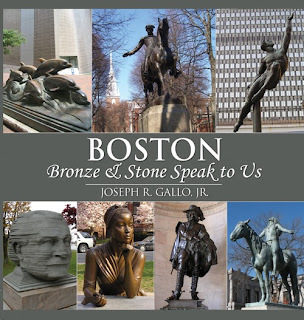 "Boston Bronze and Stone Speak To Us"by Joe Gallo is a guidebook mapping and story telling of Boston's Monuments and Statues dotting our parks and streets of the City of Boston. Labels: Boston Bronze and Stone Public Momuments and Statues. 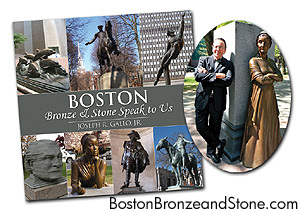 News Flash: Joe Gallo of "Boston Bronze and Stone Speak To Us" On TV once again! 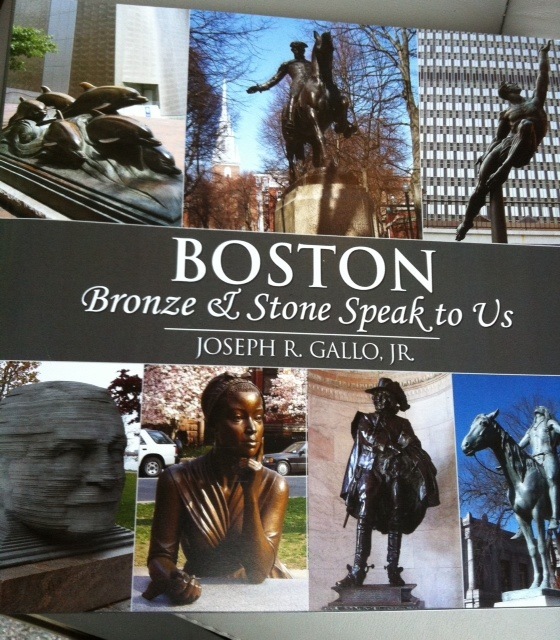 New fall talks and schedule for Joe Gallo "Boston Bronze and Stone Speak To Us" : lectures on Boston Monuments. On September 18, 2013 between 11.31AM and 1:00 pm Paula Ogier of the UMass Boston Osher Lifelong Institute of Learning , has asked me to give a talk about Boston's Bronze and Stone Monuments. All are welcomed! Joe Gallo will be conducting a five week lecture course at the Beacon Hill Seminars school of learning. The Wednesdays between September 25, 2013 and October 23, 2013. Commodore John Barry, Marque de Lafayette, Boston Massacre Monument. Edward Filenes stone, Robert Gould Shaw, frogs, etc.. Discussion of Boston public gardens with respect to the monuments within it. A closer look at George Washington, Ether Monument, Triton Babies, Edward Everett Hale, William Ellery Channing, Thomas Cass, Wendell Phillips, etc..
A closer look at the “Boston Bricks” sculpture, Robert Burns monument, The Aspiration of Freedom Monument, etc..
Memorial Day Boston Momuments and Statues 2013. “In 1868, Commander-in-Chief John A. Logan issued General Order No. 11 calling for all Departments and Posts to set aside the 30Th of May as a day for remembering the sacrifices of fallen comrades, thereby beginning the celebration of Memorial Day.” (Taken from the Stone) right photo. Thus began the birth of our Memorial Day Weekend, Boston, MA. The Civil War memorial 'The Soldiers and Sailors Monument" in The Boston Common by Martin Milmore commemorates all sectors of our countries sacrifice during the Civil War years. The above bronze monumental plaque by sculpture Emilius Ciampa is found in the halls of our Massascusetts State House. This memorial thanks our WWI military for their ultimate sacrifice. The World War II Memorial on the Fenway by John F. Paramino memorializing all who gave their lives for our country defending our freedoms. "The Massascusetts Beirut Memorial" located in Christopher Columbus Park. "Forever remembered in stone are our soldiers who defend our American freedom. Let us all hope that no more of these monuments to the dead will ever be need once there is an end to the conflicts in the Middle East." In the early morning hours of 23 October 1983, a truck loaded with explosives crashed through the security perimeter of the United States Marine Corps Barracks in Beirut, Lebanon. In the explosion that followed, 241 U.S. Military personnel were killed and 80 seriously wounded. Nine of these killed were from Massachusetts. These nine young men are clearly honored here. These young people, on a mission of peace in a land stricken by violence, were killed as they slept. They are remembered here in grateful appreciation of their sacrifice on behalf of freedom. Finally above, Boston's latest tribute and respect given to our troops who have recently sacrificed their lives for our freedoms, "The Old North Church Memorial Garden" created Rev Patricia Handloss and a committee( Jai Wei Wu, Norma Hobbs, Howaed Kaye, Christian Kulikoski, Lisa Shiller, Julliane Murphy, Andrew DeMaio, Dorothy Redmond, Brooks Brooksbank, Mailyn Kuilkonski) aand also assisted by American relatives and various religious groups who lost love ones in the Iraq and Afghanistan Wars using nameless dog tags representing their fallen heros. 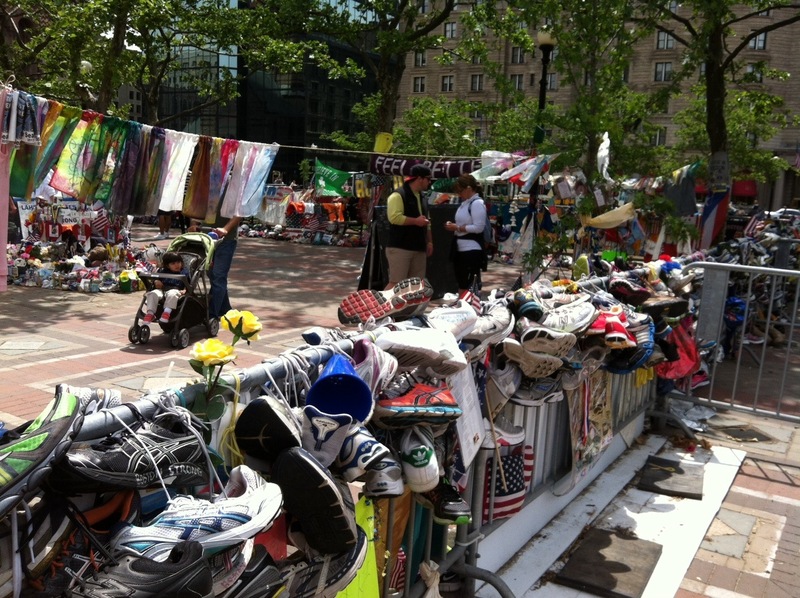 In addition, The Memorial was built by parishioners from Old North Church, the children from St John's School, members of the North End Community and numerous tourists who were traveling through as the memorial was being built. Memorial Day began in Boston, "Boston Bronze and Stone Speak To Us" , a Boston guidebook salutes and celebrates our fallen heros through Boston's Public Monuments and Statues. Talk schedule for "Boston Bronze and Stone Speak To Us"
February 4, 6:00 PM at the Pearl Room BSA in 290 Congress Street , Boston ; Boston Society of Architects, for the "Boston By Foot" docents. "The talk directed for the dedicated docents of 'Boston By Foot' organization, I believe was successful. 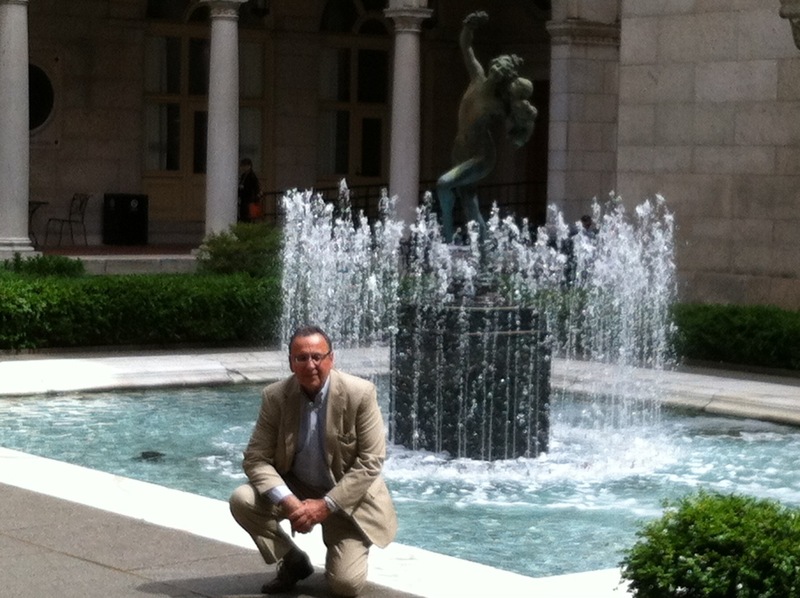 The new and different manner that we shall all view the numerous and artistic quality bronze and stone sculptures in our city of Boston's parks, streets, and public buildings has been enhanced by this discussion." The prolific portrait painter Gilbert Charles Stuart (1777-1828) is best known for the so-called “unfinished portrait” of George Washington, the face of which is reproduced on the dollar bill. Stuart mainly painted portraits of his wealthy clients, including the first six presidents of the United States, but due to his mismanagement of his business, Stuart died in poverty and was buried in an unmarked grave in the Old South Burying Ground on Boston Common. The grave cannot now be located, but this granite tablet Boston monument commemorates Stuart’s life and work. The tablet depicts a painter’s palette in bas-relief with a quill pen thrust through the thumbhole. "Boston Bronze and Stone Speak To Us"next edition shall feature this Boston Monument to one of Boston's most celebrated artists. As Arts/Cultural editor for Neighborhood Network News (www.nnnonline.org), I'd like to invite you to come to our Kenmore Square Studios on Thursday January 10 at 2 pm to pretape a 6-minute interview about your book and upcoming promotional appearance in Boston. The segment will aired later in the month on Boston Cable Channel 9 at at 5:30, 9:30 and 11:00 pm. "Boston Bronze and Stone Speak To Us " has just been invited for another interview about my book. I am looking forward to this new adventure. 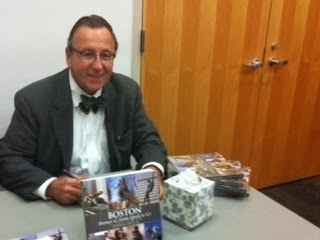 It never ceases to amaze me how excited and curious Bostonians are about my new book. This bronze sculpture ascends upward to celebrate the construction of the then-tallest building in Boston. In 1967, the Prudential Building pioneered the future of the Boston architectural landscape. Quest Eternal proudly heralds the future for the forward-looking metropolitan business community. Lead by this tall skyscraper, our current financial district became a reality.